It's always funny when stuff from the States pops up over here and reminds us of home. There's a section of the market here that sells used clothes, most of them donated, from all over the place. Last week our teammates were in the "fooka" and bought a shirt for me. One of the fun things we got to be involved in these past couple of weeks was checking out some new land that our teammates are buying to establish a new YFC center in another city in Guinea-Bissau. Wade and Katie McHargue & Family have purchased land in Mansoa, which is about 30 miles east of Bissau. The vision for the land is to be developed into a base which will host a discipleship program (Wade) and an agricultural training program to help farmers improve methods and help improve overall health with more availability of nutricious foods (Katie). I got a chance to use a new nerdish piece of gear for the first time. So, courtesy of the sweet little bluetooth gps module that talks to my smartphone, here are some GPS tracks to show the trip (overlayed on satellite photos thanks to Google Earth). 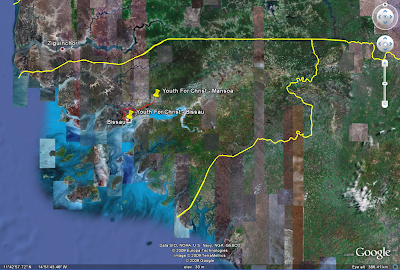 Here's the location of the two cities, Bissau is the lower left tack and Mansoa the upper right one. The red line connecting them is the road we take to get between them (about a 50 minute drive). Here's a closer view of Mansoa. It has a village feel, but has about 8000 residents. 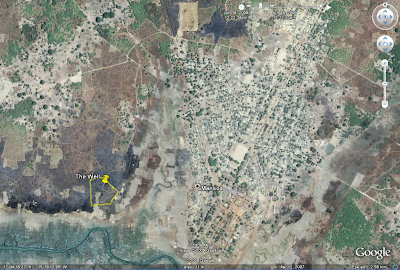 The yellow area to the east of all of the houses is the land, and the tack is the first well which is being dug right now. As they make more progress on the construction I'm sure they'll be keeping their blog updated with pictures. To check in on their progress, check out their blog. The first step is digging a pair of wells, and then when the block making machine gets here in the container in a few months, we'll start their house. Mansoa is a decent sized city by G-B standards. It's the 9th largest city in the country, but is 1/3rd the size of the 2nd biggest (after Bissau, the rest of the top 10 are within the 7,000-22,000 range). It's at a major cross-road between several other major cities in G-B, so it's a great spot for a new YFC base! We're really excited for them as they're able to start developing the land! Our trips from the U.S. to Bissau have often been interesting. Fortunately, we got a good story out of this one as well! 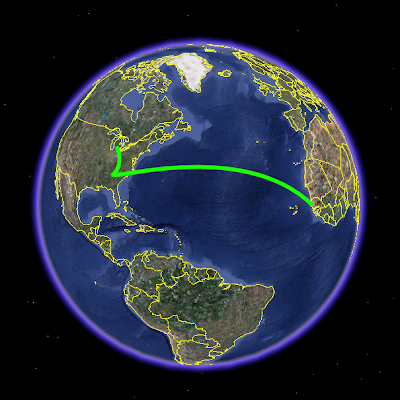 The part of the trip that we thought might be difficult went great, the dog was a trooper – we never heard a peep from her on either flight except when we stood up to get off of the trans-Atlantic flight! Not bad, Sydney! The African section of the trip however, was... a trip. :) We landed in Dakar at 5am the morning of Thursday the 4th. (We left Detroit at 10:30am on Weds.) After going through customs (where the dog was yelping, unfortunately), we got our luggage collected (it was all there – nice!). We have never had good experiences in Dakar. Whenever we're there we're by ourselves, and since we don't know the city or the language(s), it would be stressful even if everything went right, which it never does. :) We had been dreading this part a little bit because we needed to get a taxi from the airport to the SIL guesthouse we were staying at, and we only had English directions (which the driver would never understand). Then the next day we needed to repeat the procedure from the guesthouse to the ferry port. Fortunately, God was looking out for us and a missionary friend of ours was at the airport that morning to pick up the luggage of a guest who had come in the day before without his bag! So, Mario (who does speak French) took us to his hotel to relax and stretch out, called his taxi driver, and told him where to take us and how to get there. Awesome. We had a nice night at the SIL guesthouse, got to do a little Skyping to let people know we were safe, and got caught up on sleep (neither of us slept much on the overnight flight because of several crying babies). We woke up Friday morning feeling good (fortunately in Dakar they have power all night, so the guesthouse fans let us sleep.) The SIL workers told us the French words to tell the taxi to get us to the port, where we would take a boat from Dakar to Ziguinchor (bypassing two border crossings). Thanks to Pastor Mario and the SIL guesthouse, this trip in Dakar was a great success! So, the part of the trip we were worried about was no big deal... but then the fun started. We got to the port and waited in line to get checked in for several hours (despite already having tickets, but on this boat they check your luggage like and airline flight). The whole time we were waiting we were worried they were going to see the dog and tell us we couldn't get on the boat (since the webpage about the boat is silent on the subject). Fortunately, no one said anything and we got in the line to board the boat. As we were getting on the boat, they did notice her, but by then we had already been put on the manifest, so even if they'd wanted to, I don't think they could've kicked us off. They did make her ride on the lower deck with the cargo, but other than getting mad at us for making her go all night without food or grass to go to the bathroom on, she was fine. We found a good secure spot for her crate under a big anchor that wasn't going to be moved, and headed upstairs. The boat is very un-West African. It's beautiful, well run, and clean. We had tickets for two of the beds in a four-bed room (there are also two-bed rooms for $4 each more, which would have been totally worth it, but you can only buy tickets in person at the port, so by the time Mario got them the week before, those rooms were all full.) However, if he had gotten one of the two-bed rooms, we would have missed out on what came next. We got on the boat at 6pm or so, the boat left port at 8:30pm, and we went to the onboard restaurant to have dinner. The food was really good! In many other cultures where equipment and floor space are more important than your personal space, it's normal for several parties to share a table, so all of the chairs are being used. We sat down with a nice couple (he was German, she was Senegalese) with a pair of 18 month old twin girls. They were trying their best to wrangle the kids and eat at the same time so we played with the kids a little and got to know them. We found out that they hadn't been able to get tickets for a room at all, the coach tickets are for seats in a big room. The seats are nice, but they're still seats. So we offered to give my bed to the mom and the two kids (kids don't count for tickets on the boat, so she could have bought that ticket the same as I did and been within her rights to have the two girls there with her). The family gratefully accepted and I headed to the coach seats with the dad. I fell asleep pretty quickly, thanks to how tired I was and the sweet travel pillows that my brother Sam got for Em and I for our birthdays. I woke up to Em standing in front of me shaking me. I was awake pretty quickly, wondering what had gone wrong (there were many possibilities, as my wife was sleeping in a small room with one strange man and two other women, with all of our stuff and a big load of currency as well.) Apparently the guy who was in the 3rd bed had come back to the room a little drunk (we found out later), heard one of the twins fussing a little (there are shades over the beds, so he couldn't see them), started yelling about a baby being in the room, found out that it wasn't Emily's, that I had given away my bed, gotten really mad, and started yelling. This of course made the baby cry more, which led to more yelling. He seemed genuinely offended not necessarily that I had given up my bed, but that I had given it to a woman! (Because obviously women should be in coach and men should have the good spots.) Oh, how cultures value mothers differently! So, the mom started crying. The guy called three cabin stewards over, alternatively yelling at them, the mom, and Em. The mom and the twin she was holding were taken to the room the boat uses as the clinic, leaving Em and the second (still sleeping) twin in the room. Em sneaked away to come wake me up, and we headed back to the room, ready to give the yelling guy a piece of my mind for yelling at my wife. Fortunately, by the time we got back to the room, the stewards had calmed the guy down enough that he kept his trap shut the rest of the night. We took the second twin down to the clinic, where they let the family sleep, headed back upstairs to our room, and fell asleep. We woke up the next morning (Saturday) on the boat, went to find the family to make sure there weren't any permanent emotional scars left the night before, and walked around the decks a little. We arrived in Ziguinchor at about 9am, and Pastor Mario (who had already had plans to drive from Dakar to Ziguinchor) met us at the port and took us to a hotel restaurant where he was having some meetings. Our travel plans for the 80ish mile trip were to ride with one of Mario's project leaders, who was driving up from Bissau for a meeting with him in Ziguinchor that day, and then driving back down. The timing worked out great, we were able to just bum a ride with them. We waited for Mario's guys (Andre and Benjamin) to arrive, but got word that they were moving slow because the truck they were driving up in was making a strange noise. They got to Ziguinchor near noon, took the truck to the mechanic who said it was fine, and then had their meeting. We left Ziguinchor at 3pm. We knew we needed to make good time because there is a ferry several hours into the trip that stops running around dusk. We drove two cars down to Bissau: the truck they brought up, and Mario's Jeep, which was going to be stored in Bissau. An hour into the trip, the truck died, and we started towing it with the Jeep. The towing implement was a thick Nylon rope with hooks. The rope broke three times as it presumably slid under a tire when the lead car slowed down, melting it in two. Each time we tied the two halves together and started going again. We got to the ferry at about 6:30pm, and saw the ferry on our side of the shore! That's good news, because if it's just leaving when you get there, it's another hour and a half for it to get to the other side, unload, reload, and come back. Unfortunately, it was on our side and full, so it loaded, left, and we watched it come back around 7:30. The ferry started to load, and when we got to be the 2nd vehicle in line, it was full again. We watched the ferry leave, get to the other side, and unload... and then it got dark. Everyone on our side assumed the ferry was coming back, but by 9pm, it became clear that it wasn't coming back. A canoe came from the other side to take some of the people over, but since we had cars, that option wasn't available to us. The canoe driver said the ferry people had said something about an engine problem. Hmm... now what? We decided to make one last desperate attempt. Here I am waiting for the ferry's 2nd trip back to our side. Wait you say, there's a bridge in the background! Correct. This bridge was finished a couple of months ago and it waiting to be “inaugurated” before the wire rope barring entrance to it is removed and people can use it. So, we decided to walk to the other side of the bridge and see if the soldiers there could be “convinced” to let the fence down and let us pass. No dice, apparently the person in charge of the project had forseen the guards' susceptibility to bribery and not given them a key. So after setting foot on the side of the river we were trying to get to, at 10:30pm we walked back over the bridge to the cars, and decided to sleep and wait for the first ferry the next morning. Emily and I tried to sleep in the Jeep, and Andre and Benjamin took the truck. The problem was, Bissau is really humid this time of year, 15 degrees hotter than Dakar, which had already seemed hot to our unadjusted bodies, and since we were by a river, the air was full of mosquitoes. (The malaria carrying kind which I now work hard to avoid.) So we tried to sleep in the car with the windows rolled up. Sweating profusely, sleep wasn't very possible, so we decided to roll the windows down just an inch to see if the breeze would let us get cool enough to sleep. Still not doing it. We rolled them down several inches, started swatting mosquitoes, and trying to sleep. The pools of sweat still made it difficult. Finally at about 2am I had the brilliant realization that the car had A/C. So, despite not being sure of exactly how much gas it would take to get to Bissau, we decided we had to chance it. We ran the car five minutes every hour, and it cooled the car enough for us to sleep with the windows up. We got up at 6am and waited for the ferry. At 9am we crossed over, started the drive, and soon after broke the nylon rope again. By this time it was too short to keep tyeing, so we looked around for other options. In the Jeep there was a rope, about 1/4” thick. The kind of rope you might use for a laundry line. They said, this will work, no problem. They just laughed at my response: “N ka fia chiu” (I don't believe it much). They doubled the rope over and tied it on. The Jeep started moving slowly, and the truck did follow. Since we hadn't planned on such a long excursion, no one had brought extra water, so by the time we hit a major city at 11am, we were glad for the ability to buy more water. We had about two hours of driving to do (at normal speeds) to reach Bissau from the ferry. The rope broke every time we went over a big bump, and we kept tyeing it back together. Eventually we did reach Bissau, making a four hour drive of a two hour trip.